We’d love your help. Let us know what’s wrong with this preview of Capsized! by Patricia Sutton. New York Public Library's "100 Best Books for Kids"
Kirkus Reviews' "Best Books of 2018"
On July 24, 1915, the SS Eastland, filled to capacity with 2,500 passengers and crew, capsized in the Chicago River while still moored to the pier. Happy picnic-goers headed for an employee outing across Lake Michigan suddenly found themselves in a struggle for their lives. Trapped be New York Public Library's "100 Best Books for Kids"
On July 24, 1915, the SS Eastland, filled to capacity with 2,500 passengers and crew, capsized in the Chicago River while still moored to the pier. Happy picnic-goers headed for an employee outing across Lake Michigan suddenly found themselves in a struggle for their lives. Trapped belowdecks, crushed by the crowds attempting to escape the rising waters, or hurled into the river from the upper deck of the ship, roughly one-third of the passengers, mostly women and children, perished that day. The Eastland disaster took more passenger lives than the Titanic and stands today as the greatest loss of life on the Great Lakes. Capsized! details the events leading up to the fateful day and provides a nail-biting, minute-by-minute account of the ship's capsizing. From the courage of the survivors to the despair of families who lost loved ones, author Patricia Sutton brings to light the stories of ordinary working people enduring the unthinkable. To ask other readers questions about Capsized!, please sign up. How many of us have a forgotten family story? Our family has an actress from the silent film era that is lost to time. Reading Capsized would be a perfect springboard to this kind of family research. A great read for adults and kids alike. Lots of information and anecdotes about a little known tragedy. Loved it. What a page turner. I literally could not put this book down. I live in the Chicago area and was glad to learn how and why the passengers of the Eastland met their fate that July day in 1915. Sutton's research made the characters jump off the page. I highly recommend this book. Tragedy often causes great sorrow among many but its memory lives longest with those directly involved. It is good sometimes to reflect on these lesser known events and remember the victims just as on this historic day we think of those killed in the collapse of the Twin Towers in New York. My thanks to Patricia Sutton for bringing the story of the SS Eastland to light. Capsized! : The Forgotten Story of the SS Eastland Disaster presents the story of those who suffered and died that day in a fact Tragedy often causes great sorrow among many but its memory lives longest with those directly involved. It is good sometimes to reflect on these lesser known events and remember the victims just as on this historic day we think of those killed in the collapse of the Twin Towers in New York. Capsized! 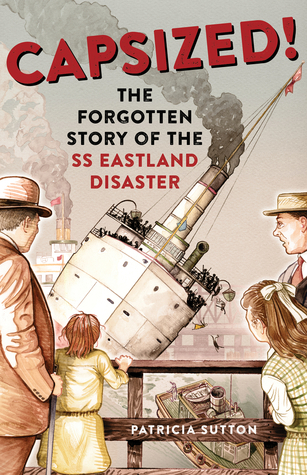 : The Forgotten Story of the SS Eastland Disaster presents the story of those who suffered and died that day in a factual but very personal manner, relying on news reports and recorded survivor and witness recollections. It's disturbing that so little common sense was used in the loading the ship prior to the accident, and given the facts presented by the author, that those responsible were not held accountable. In that respect it is similar to the sinking of the Sultana fifty years earlier on the Mississippi River. Designed with a capacity of only 376 passengers, the Sultana was carrying 2,155 when an explosion and fire killed 1,192 returning Civil War troops and family members. No one was held accountable then either. I'm not sure about the claim that "The Eastland disaster took more passenger lives than the Titanic". Lists of Maritime Disasters usually show 1514 lives lost on the Titanic and 844 for the Eastland. And the world also was reeling from the sinking of the RMS Lusitania by a German torpedo just two months earlier. And, like the great Peshtigo Fire the SS Eastland Disaster was soon overshadowed by other events. Wow. This gripping nonfiction story of the most deadly disaster on the Great Lakes is awesome! I tend to read picture book nonfiction (or adult nonfiction), but not a lot of middle grade nonfiction. I'm so glad I made an exception in this case. Sutton follows the stories of nine individuals or families on July 24, 1915, the day of the annual Western Electric picnic. The U.S.S. Eastland is one of several ships scheduled to take employees and their families from Chicago to the picnic site across L Wow. This gripping nonfiction story of the most deadly disaster on the Great Lakes is awesome! I tend to read picture book nonfiction (or adult nonfiction), but not a lot of middle grade nonfiction. I'm so glad I made an exception in this case. Sutton follows the stories of nine individuals or families on July 24, 1915, the day of the annual Western Electric picnic. The U.S.S. Eastland is one of several ships scheduled to take employees and their families from Chicago to the picnic site across Lake Michigan. But then disaster strikes, and 844 people die. My husband and I love Chicago, and I'm usually there at least once a year, if not twice. We also love ships and watch the iron ore freighters come and go from Duluth, Minnesota (on Lake Superior), whenever we have the chance. Yet I'd never heard of the Eastland disaster. Once I picked up the book, I couldn't put it down. I knew death was coming, but I didn't know which characters would survive and which wouldn't. It was like watching a tragedy in slow motion--there was time to recognize every poor decision, every bit of good or bad luck that was going to change characters' fate. I couldn't look away, and it felt like one small way to honor those lost, by learning about this disaster--by witnessing their story. Sutton provides excellent citations, and it's clear that extensive, meticulous research was done. I found not only the human story fascinating, but also the engineering story--and even the history story. Why did the Eastland capsize while still moored to a pier? Who were the 2,500 people crowding her decks? What were their lives--and, in some cases, deaths--like? Sutton answers all these questions in an excellent nonfiction book that's as gripping as a novel. Highly recommended. Really a high middle grade book, which I didn't realize when I picked it up. But it involved a disaster on Lake Michigan that killed more people than the Titanic disaster, and I had never even heard about it. Very good, though heart-wrenching. I think this is the author's first book (she is/was a teacher) and I think it's a great first effort at history for tweens, young teens. I learned a lot from it and it would spark good discussion with that age kid. I'm not sorry I read it at all! This book is an excellent source of information regarding a horrible accident which took place in Chicago over 100 years ago that, compared to the Titanic, is fairly unknown. Patricia Sutton provides lots of interesting facts that I had never heard of before, including the reason why the Titanic disaster 3 years earlier was an ironic contributing factor to the tragic series of events that led to the Eastland disaster. Two thumbs up! Like many, I had never heard of this ship disaster. I found this on the new shelf at our library. The vintage-style cover of the book caught my eye immediately and I wasn't disappointed. This is not a long book, but it packs a good punch. The eyewitness accounts, along with the black and white pictures made this sad news real, to me. The "notes and Bibliography" really added to this books testament of the disaster. I will be doing more research on the people involved! A clear, sobering account of a forgotten American tragedy. Written for a young adult audience, the book may not go into quite the detail that a fully realized study would, but the story is clear and the emotional impact is strong. Putting focus on a half-dozen people and families affected draws us into the account and keeps us connected throughout. This is a bit of a middle grade/chapter book crossover in terms of the language and content. It is fairly upsetting, although not hugely graphic, so parents really want to be sure their kids are up for it. There's a good selection of photographs as well, which may add to the disturbing factor for some readers. An excellent middle-grades informational text on a mostly forgotten maritime disaster. It is effective.in its vivid evocation of young working class Chicagoans daily lives in 1915, whose excitement for a day at the beach turned to horror in mere minutes. I had not heard about the SS Eastland before reading this story. This book was an eye opener to the disaster that happened in 1915. This gripping story, full of real life photographs will be liked in my library. Greatly written book that captivated my fifth-grade students as we learned about some of our country's history. There were a lot of characters that were difficult for us to keep track, but next year I'll have my students write some character profiles to help us. This is a wonderful book. Well written and answers most questions that may arise while reading. There are pictures and diagrams and the point of views from the passengers is monumental in understanding the tragedy of the event. At port on the Chicago River, July 24, 1915, just loaded with 2,500 passengers from Western Electric ready for a celebration picnic day, this ship built for the Great Lakes lists and capsizes before pulling away from the dock. Includes photos and diagrams. So compelling and well told! Cybils Junior High Shortlist. Giving all of these the same three stars, and waiting until after 2/14/19 to post reviews. This is one of the most depressing children’s nonfiction books I have ever read. It left me super pissed at the maker of the boat for not doing an original stability check on the boat. Wonderful non fiction i couldn't put down. Great for 4th grade thru adults. 844 people died on this morning in the Chicago River and SO many of us never heard this story. Great quick read. Chock full of facts and details, you can’t help but feel that you’ve been transported back to Chicago in the day. Wonderfully done. I had never heard of this until I picked up the book at my local library. Informative and enjoyable. An important look at a tragedy that didn't get the attention it deserved because the victims weren't the "right" kind of victims. Very well-written story about the Eastland. How is it possible I never learned about this, growing up in the suburbs of Chicago? It’s a young adult book but worth the read.